Jason Van Dyke was sentenced to six years and nine months in prison on Friday. 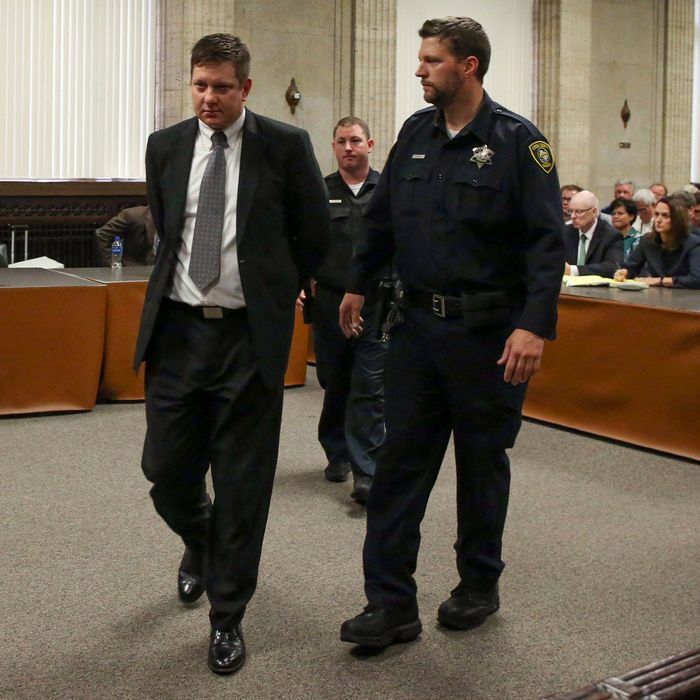 The Chicago police officer was convicted in October of second-degree murder and aggravated battery for the 2014 shooting death of Laquan McDonald, a black 17-year-old. Van Dyke will probably not serve the entirety of the sentence — for second-degree murder charges, only half of the sentence is mandatory. The murder likely would have gone unnoticed by the broader public had inconsistencies between the autopsy report and the narrative put forth by officers at the scene not prompted reporters to demand that dashcam video of the incident be released. The city denied at least 15 such requests before a judge compelled officials to do so. The footage showed Van Dyke shooting McDonald 16 times as the teen was walking away. More than a year had elapsed between the murder and the day in November 2015 when the people of Chicago — and the country — learned what had really happened. It has long been clear that black Chicagoans have little reason to expect humane treatment from law-enforcement officials. A report published by the Department of Justice in 2017 affirmed what residents had known for decades: that local police engaged in a “pattern or practice of unreasonable force” on duty and “tolerated racially discriminatory conduct” that “[undermined] police legitimacy.” Such conduct went beyond the racial disparities in arrest and use-of-force rates that can be observed in many cities. Under the late Jon Burge, who was hired by the Chicago Police Department in 1970 and fired when he was a commander in 1993, the use of black sites, where black men were tortured with cattle prods and nightsticks into giving coerced confessions, was routine. Burge went to prison for his crimes, but accountability has otherwise proved largely elusive. Just this week, three officers present at the McDonald shooting were acquitted on conspiracy charges. They had exaggerated the threat McDonald posed in their reports, lending cover to the false claim that Van Dyke was justified in opening fire. Van Dyke’s conviction represents something of an anomaly, as such. According to CNN, citing data compiled by Bowling Green University criminal justice professor Philip Stinson, who tracks such cases, only 35 percent of the 80 officers charged with murder or manslaughter for an on-duty killing between 2005 and 2017 were found guilty. That’s about two per year — a conviction rate that attests to both the broad latitude and vast protections which police are afforded when they take lives. Police prosecutions generally have to be more or less ironclad to secure convictions. According to the Bureau of Justice Statistics, the general population murder conviction rate is twice as high, even as more than 90 percent of those cases are resolved through plea bargains. Even so, and despite their rarity, criminal convictions remain among the few forms of recourse available to victimized black families and their communities, who must come to terms first with the abrupt demise of a loved one, friend, or neighbor, and second with the probability that nobody will be held accountable for it. Accountability, here, is a euphemism for punishment. That’s not to say punishment is unwarranted, but rather a clarification of how narrow this allocation of responsibility actually is. True accountability would indict the entire system that allowed McDonald to be killed. Punishment tends to concern itself with who can be proven guilty, and is more individual-focused as a result. But one man being sent to prison does not compensate for an atrocity whose dimensions transcend any individual. Nor is prison necessarily the answer. Perhaps the three officers acquitted of conspiracy for their role in shaping the narrative around McDonald’s death really were not criminally liable. Perhaps Mayor Rahm Emanuel’s administration was not either, for withholding information about the crime for a year; nor, perhaps, was the ousted prosecutor Anita Alvarez, whose failure to charge Van Dyke until public outcry made her reticence untenable led to her being voted out of office in 2016. But the absence of a provable crime does not mean that a greater wrong was not done, or that that wrong does not continue to rule the day in Chicago. The conditions that led to McDonald’s death are still abundantly present — namely, that the city has chosen to address its history of redlining black residents into pockets of segregated disinvestment and entrenched poverty by submitting them to armed occupation. Sacrificial lambs like Van Dyke, Alvarez, and the dismissed former police superintendent Garry McCarthy give the impression that the city is cleaning house — that bad apples are being shaken out of the tree, paving a path to reform. In reality, it is the tree that needs uprooting, the earth razed around it. Van Dyke may be facing punishment. But it would be a mistake to confuse his punishment with recognition that the responsibility is far more widely distributed, and the wrong more fundamental.